I post a lot of my work outfits from the weekdays, but I don't post many of my weekend outfits. The weekends are my days to play catch up. 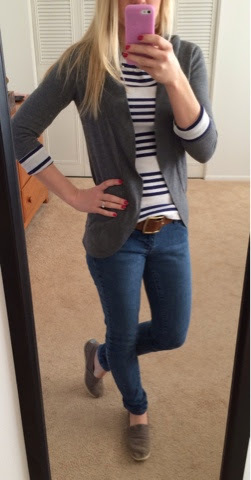 I usually run errands and spend time at home, so I like to be comfortable and casual, but still look cute. So here is my grocery store, errand running, causal Saturday look. Causal and comfortable, does not have to mean frumpy. How do you dress on the weekends?